But first thing’s first. This challenge is about inventions and improvements, and I decided rather swiftly that I wanted ’my’ invention to be gelatin. And by that I mean processed, store-bought gelatin as opposed to the more old-fashioned way of acquiring jelly, since boiling bones and skin isn't something I’d like to do (and I hardly think my kitchen is equipped for such an enterprise). Besides – I learned during my research that my native country Sweden is home of the largest pigskin gelatin factory in the world (if that doesn't make you feel peckish, I don’t know what will) so it must have been written in the stars! When I embarked on my research, I thought the history of processed gelatin would be pretty straight-forward, as in: ”It was invented by So-and-so in 18XX”, but that wasn't quite the case. Many online articles stated that modern gelatin began when the American brand Jell-O was introduced in the 1890’s, but when I looked in cookbooks older than Jell-O I realised that that couldn't be the case (I think Jell-O was the first flavoured, and granulated, gelatin product to hit the market and that’s why there’s some mix-up). I was curious when the gelatin leaves I’m used to were introduced and also what the product may have looked like before that. After some fruitless searching I eventually found the wonderful 'Gelatin Handbook: Theory and Industrial Practice' on Google Books (you can read most of it and fortunately the history chapter was more or less complete) and most of my inquiries were put to rest. To put it shortly: gelatin is produced the way glue is produced, because (if I understand correctly) gelatin is animal glue in it’s most purified form, so it was the glue producers who eventually started to produce gelatin for distribution to consumers. 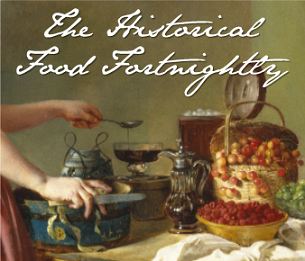 At the beginning of the 19th century large-scale production of edible gelatin was not yet in existence, but that would change rapidly during the century. Plants started to operate in France, England and America, and Germany seems to have been extra industrious in this regard, not least since gelatin started to be used in photography! During the mid-19th century and up to about 1880-1890, the purchasable gelatin was in the shape of ”thick gelatin plates, like those of chocolate” as ’Gelatin Handbook’ describes it. Things started to fall into place for me at that point, since some recipes I looked at talked about ”slices” of gelatin, as if you were to cut a piece from a block or something. Many recipes also advised to soak the gelatin for much longer than what I’m used to before melting it, which would make sense if the gelatin came in thick pieces (in advertisements from the 1850’s and upwards I also found many mentions of red or white gelatin, and the French variety seems to have been regarded as the best). There appears to have been a veritable gelatin boom in Europe and especially Germany after ca. 1865 which makes sense if you look at those fantastic jelly moulds from the Victorian kitchens – you need a lot of gelatin to fill those up! Somewhere around the 1880s, the thin gelatin leaves that I’m unfamiliar started to come about, and also the powdered form. What I haven't yet figured out is how expensive gelatin was at different points during the 19th and early 20th century, but I may try to find that out later on. Or maybe you can tell me? Nougat made from almonds, hazelnuts and sugar? Yummy! Cream as well? Even better. It can’t fail, right? Honestly, I’m usually the first to blame myself when my cooking endeavors fail but there were a couple of things about the instructions in this recipe that bugged me… But, I had decided to halve the recipe and maybe you weren't supposed to do that. Who knows. The first thing that irked me was that it said to ”chop” the nuts. Not grind them, but chop. So i chopped them the finest I could, even though I thought to myself: ”Why not just grind them?”. But perhaps this nougat was supposed to be more chunky? What did I know. 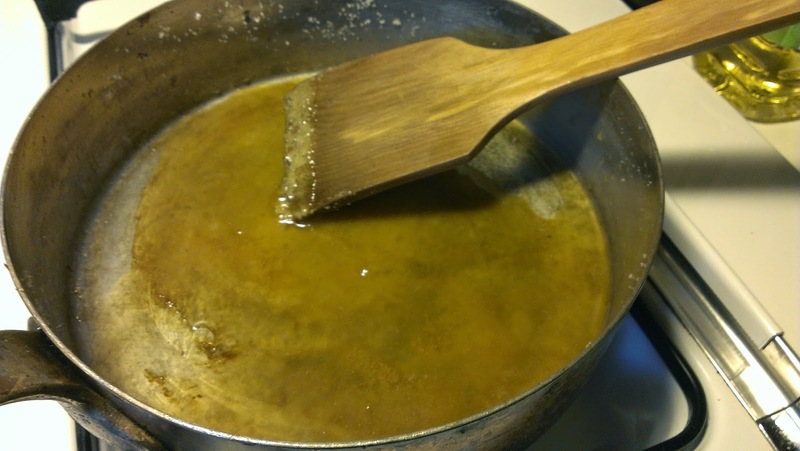 Then I melted sugar, carefully, in a greased frying pan as per instructions. 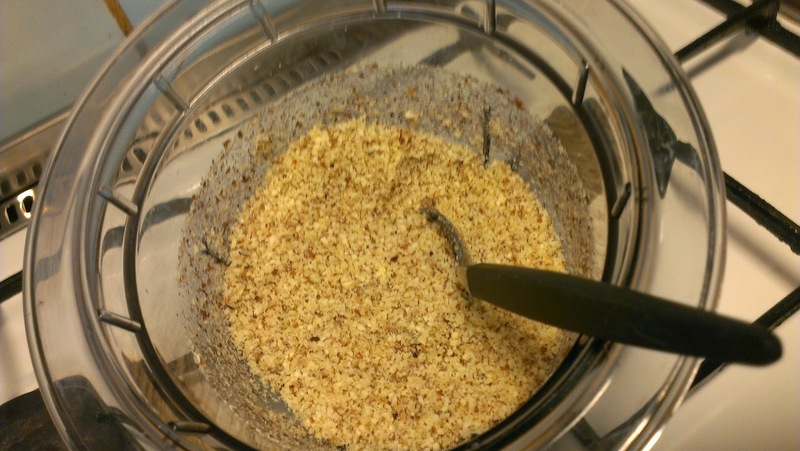 My own fault in this may have been that I used a too wide-bottomed of a frying pan for that amount of sugar (I did halve the recipe after all), because when the sugar had melted, there wasn't a whole lot of it, which became very apparent when I added the chopped nuts. The recipe suggested that this mixture would be rather liquid since it was supposed to simmer for a bit. Liquid? Not a chance! I had a hard, chunky dough on my hands. Which smelled delicious, but I was thinking about abandoning it all by this point. But I didn't because those nuts were expensive, dammit! So I warily mixed the paste/dough with 1 egg plus one yolk and three leafs of gelatin, rinsed in water and melted in a few tablespoons of warm water, and let it chill. 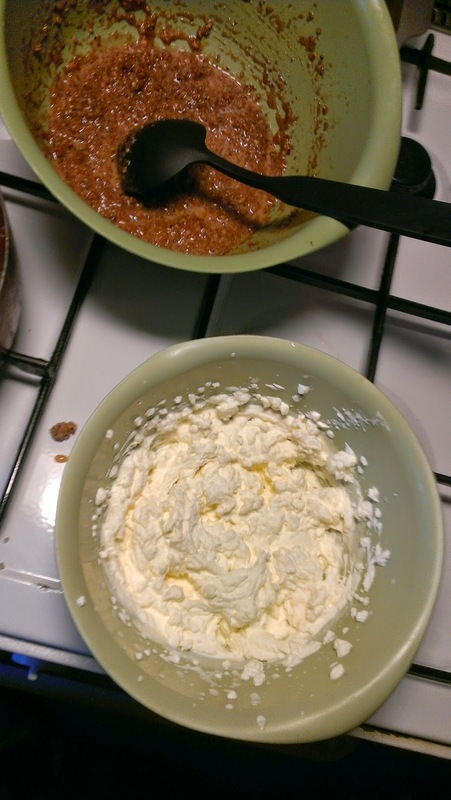 Then I stirred in 2 deciliters of whipped cream and mixed gently. All that was left was to put it all in a jelly mould in shape of a pineapple (because that was the only one I had of the right size and I didn't really care at this point anyway), said a prayer and banished the pudding to the fridge for a few hours. You can all laugh, gag or whatever now. I know. I know. 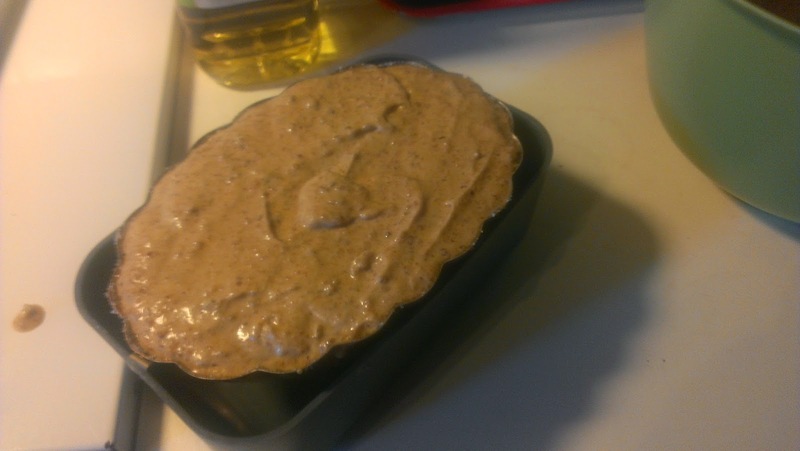 "Cat food" is the nicest thing I can compare this pudding's appearance to. I could say something else as well, but I won't. Because we all know. 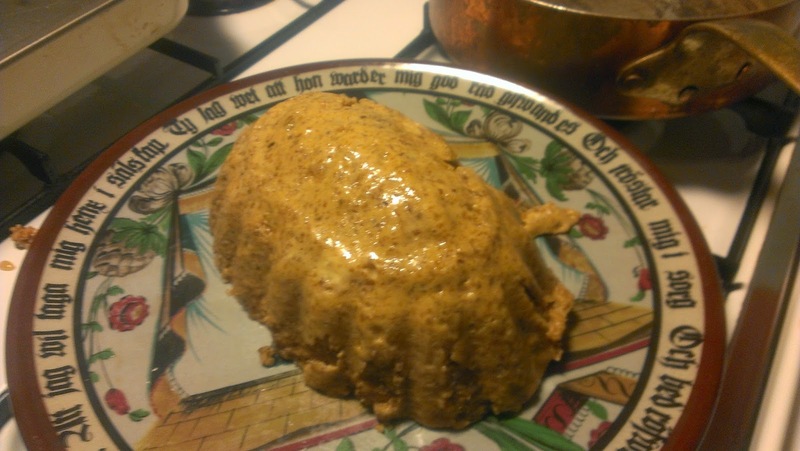 This may have been one of the grossest-looking things ever to have come from my kitchen (and I did 1970's recipes at least one a week as an experiment for two years so I've seen some things). Of course, this terrible presentations doesn't help a bit. If I had made an effort with some berries or whipped cream or something, maybe it would have looked... Nah, who am I kidding! But how did it taste, you must ask. Actually quite good. I was right about the nuts, though: in my opinion, they should've been ground, not chopped. I would have liked a smoother pudding. The taste was still quite nice, if a little bland. The cream made it more like a thick mousse than a jelly (and there were only three gelatin leaves in it after all) which was nice. With some experimentation, this could perhaps become a hit. Next time: smaller frying pan. More sugar or less nuts. Grind those nuts. The Challenge: The Best Thing Since Sliced Bread. The Recipe: Nougat pudding, from Iduns Kokbok, 1911 (Idun was one of the biggest magazines for women in Sweden in the late 1800s and a better part of the 1900s). The Date/Year and Region: Sweden, 1911. How Did You Make It: Chopped almonds and hazelnuts. Melted sugar and mixed in the nuts. I halved the recipe, and I don't know if that screwed it up or if the recipe was off, but it appeared to be too high a nuts to sugar ratio. 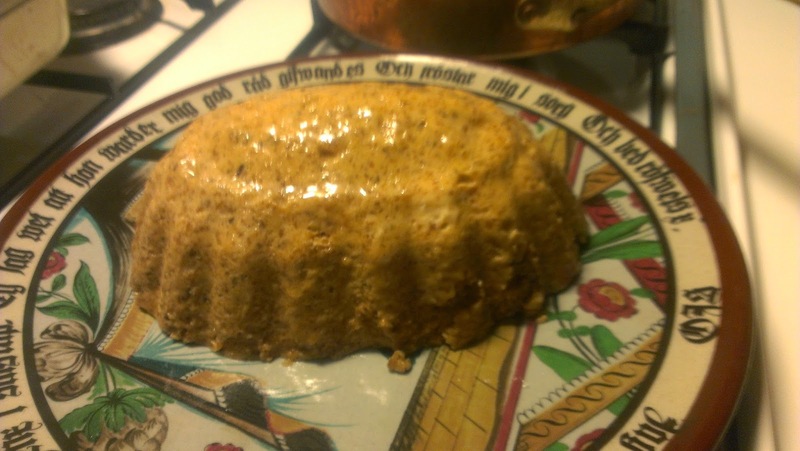 I mixed sugar/nuts with eggs and gelatin and added whipped cream and allowed to set in a mould in the fridge for a few hours. Time to Complete: The preparations, maybe 30 minutes, but it needs a few hours to set. Total Cost: The nuts were the expensive part. At least $10/7 EURO (but I didn't use all the nuts I bought). How Successful Was It? : Appearance: 1/10. Taste: 7/10. How Accurate Is It? : I used modern kitchen aids like an electric chopper and whisk, other than that nothing too out of place. Östman, E. (1911). Iduns kokbok. Stockholm: Ljus. Oh, I'm working with gelatin also for my challenge! That looks like an interesting recipe, although since I'm allergic to nuts I couldn't make it. Gelatin is lots of fun! Header image, Dinner drest in the neatest manner by Thomas Rowlandson, courtesy of the Lewis Walpole Library Digital Collection.